“We grow where we are planted.” This is the theme of a conversation on an earlier post from this year. All of us have the opportunity to do regenerative work in the world, in the spaces and places we already inhabit. I want to offer examples of “growing where we are planted” when I am able–and today, I have an inspirational story of a new permaculture site in the making in my hometown. We can see the permaculture principles at work, which makes a great continuation last week’s post. Further, this post also will provide some additional ideas and suggestions for those who find themselves practicing sustainable living in apartments, cities, or other urban settings. 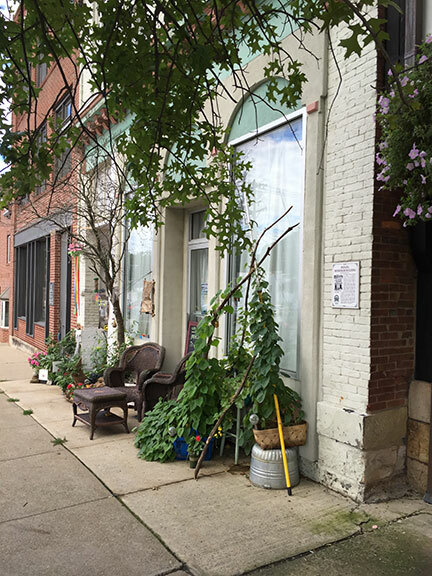 I met a friend who recently moved into a building in in the downtown area of Indiana, PA. Trinity has owned this building for some time, but only recently began living there due to some challenging and changing life circumstances. Despite being in the building for only several months, she is already doing great work in terms of urban permaculture. 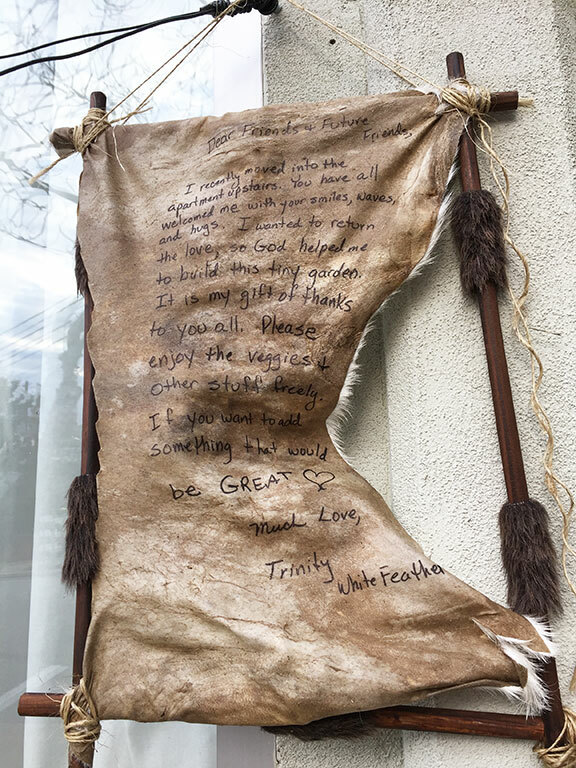 Trinity’s long-term goals include the creation of a space to go, learn, create, and learn, both bardic arts as well as regenerative living. Trinity is the second woman I’ve featured on this blog that has had major life changes lead to a new permaculture design site. Its interesting how some of the best things in life happen when we are overturned, unsettled, or otherwise stirred up from our comfortable places of being and inhabiting. I’ve certainly understood that feeling well myself, especially in the last few years. To use the metaphor from the Tarot, the tower crashes down, and once the dust settles, we can clear the rubble and build something new and better. Who wants a tower anyways? What about a rooftop or front yard garden? What about a giving tree? This principle–of letting go and rebuilding–is a powerful lesson about the interplay between the power of doing good in the world and that of alchemy and personal transformation. Our lives rarely go as we expect, and sometimes, a lot of difficult things happen to us in a very short period of time. We are left responding in whatever way we can–often, that means, physically moving somewhere new, leaving the beautiful homesteads and farms behind, and finding places to heal. What amazes me is the power of the human spirit to overcome personal difficulty and use it as a creative and regenerative force for good. 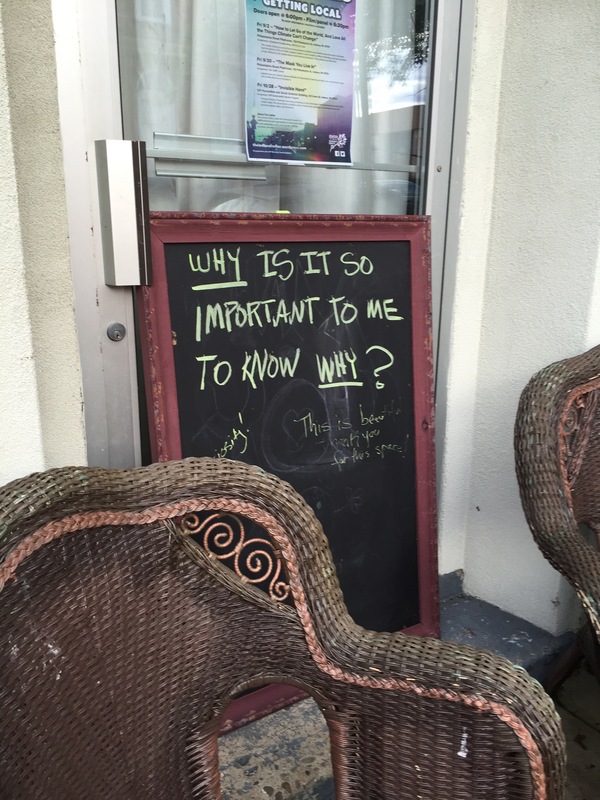 There is a powerful lesson in this for all of us–one, in my opinion, of the most important ones I know. That we will face tragedy and challenge is part of being human. What we do with that, how we transform it, what we build and grow from it, is what makes us shine. So let’s spend some time with the bright light that is Trinity, and the space she is creating! Trinity has no access to soil; rather, her building is on a main street, shares walls with adjacent buildings, and has concrete or brick on all four sides. 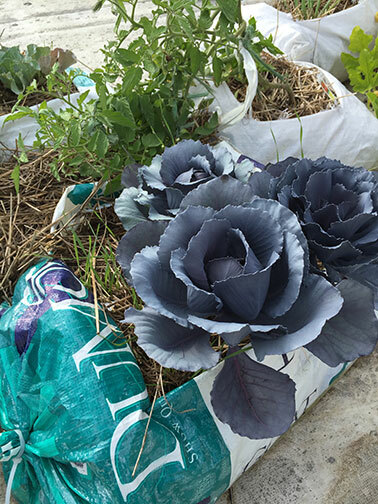 Despite these challenges, she has rose to the occasion, “greening” the concrete, growing vegetables in nooks and crannies, and beginning many transformations. I’m excited to follow her journey here and see how her space develops. I think that her work can be inspirational to many of use who are living in very limited circumstances, be those financial, space-wise, and more. One of the first things Trinity wanted to do was to bring a sanctuary space to the otherwise barren concrete of our downtown area. Earlier in this year, most of the trees on main street were cut down to do some road work, and the downtown has been looking very sad and sparse since. Truthfully, I don’t even like walking downtown any longer since so many of the trees are gone. Trinity still does have a tree near her building on her street, but the adjacent street is completely barren. 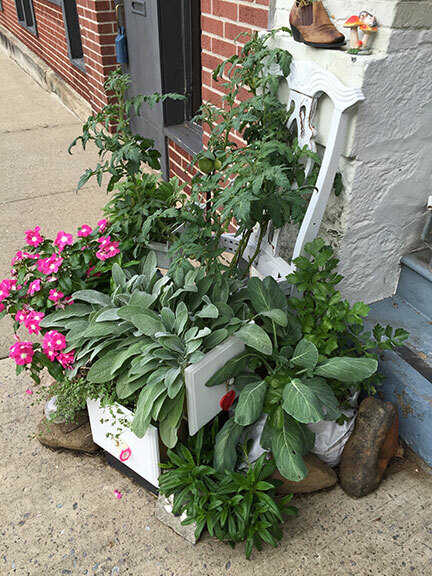 Trinity has brought nature beautifully back into the space with the “Giving Garden.” Suddenly, as you walk, along the street is a burst of flowers, beauty, greenery; a space to sit, to enjoy some veggies, and to respond on a chalkboard to a regularly changing prompt. 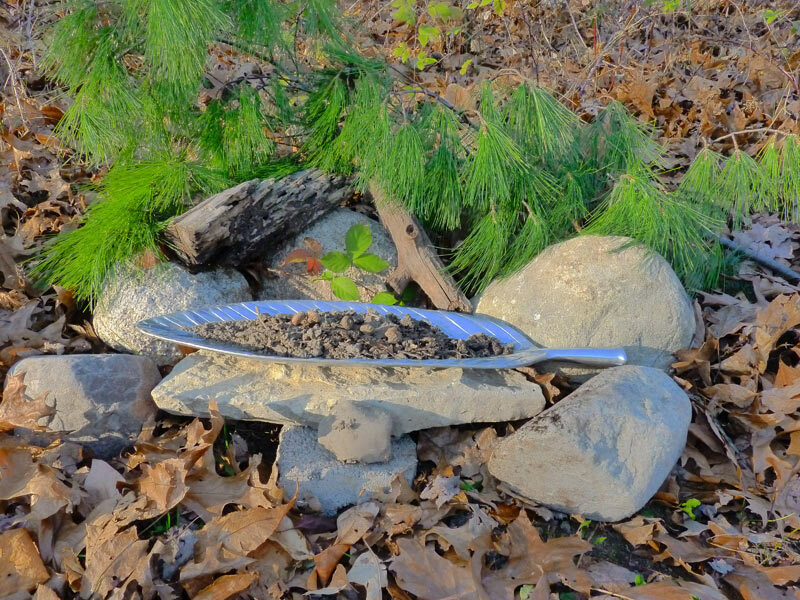 We’ll first take a stroll through the giving garden, exploring it through photographs and exploring the different permaculture principles as well as common sense principles. 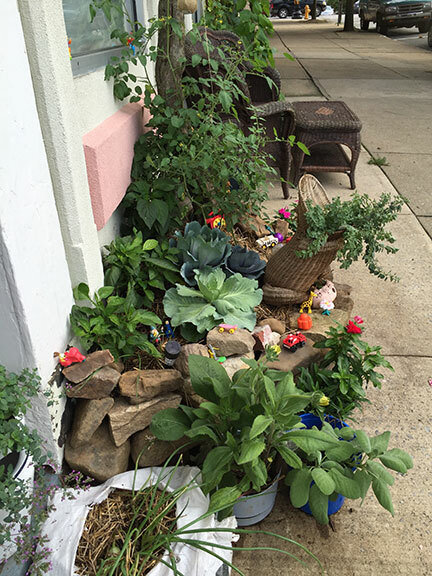 One of the keys to successfully creating publicly visible spaces (front lawn gardens, etc) is making sure they are beautiful, interesting, and pleasing to the eye. 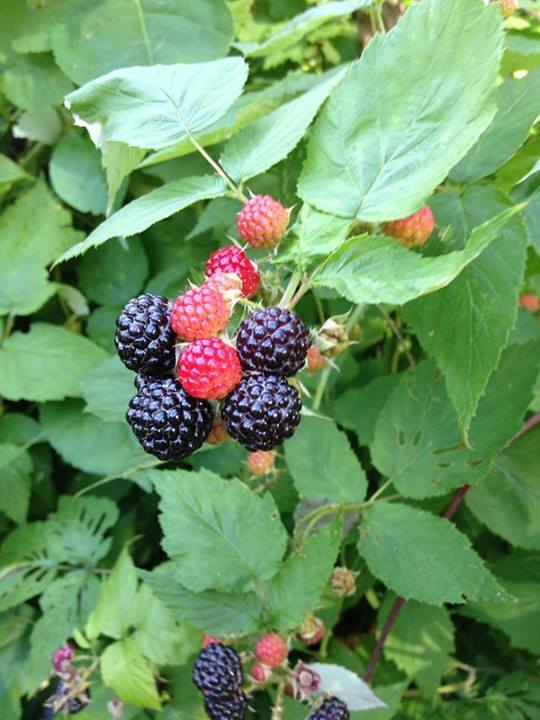 I wrote about this extensively in my discussion of Linda’s Nature’s Harvest Urban Permaculture Farm. It doesn’t matter how functional it is–if people can see it, it needs to “look nice” and not be “overgrown” as that is associated with distending. (This whole issue deserves its own treatment at some point–> the cultural assumption is that if we let nature grow unchecked, it is assumed that we no longer care for it!) And so, Trinity has done a smart thing with not only growing some vegetables and herbs, but doing so in way that draws people in. Trinity has put a lovely invitation on the wall, letting people know how the space can be used and shared. 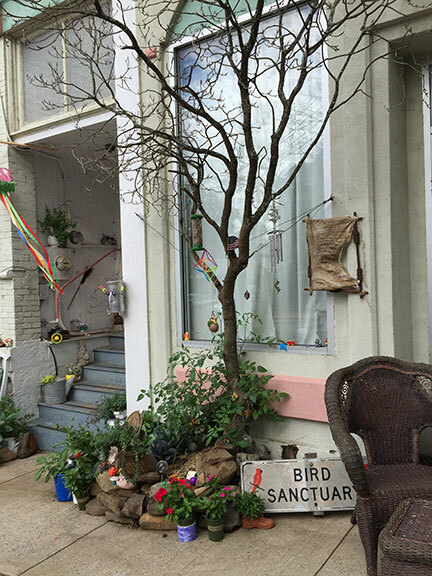 Trinity’s 30′ or so of frontage offers just sidewalk; and so to grow things, Trinity had to bring in soil, create beds, and build the space from scratch. Part of her design includes made many little “niches” in the space, creating a variety of different ways for passerby to interact. 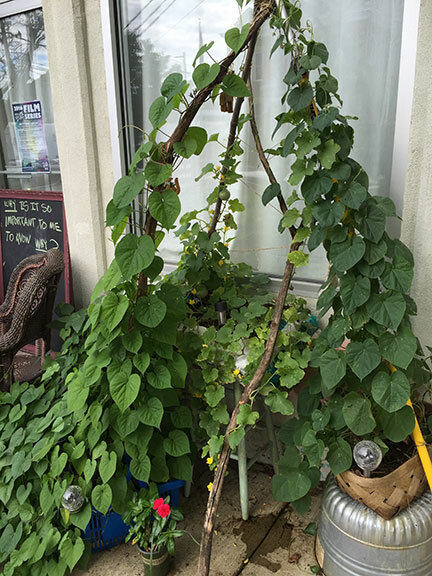 Here’s one such niche–a set of vines growing from foraged forest sticks as trellises. This is not only visually pleasing but also offers free food (squash and beans) and enacts the permaculture principles of layered purposes and using the edges and valuing the margins. Trinity is growing the vines out of tasteful planters. Another small “niche” she has designed is the sitting area, which shows up just after the squash and beans. This is a close up of the sitting area, where there is a blackboard where Trinity regularly updates the question that people can answer (and people do!) The sitting area invites people to come, be for a while, and simply to enjoy the space. She’s asking people to observe, interact and intuit in this space. Moving along the front, the next niche is the giving tree itself. People can take and leave vegetables, gifts, and trinkets. Children come here and leave and take small toys, for example. Again, there are a few principles happening here: stacking functions (visually pleasing, growing food, offering gifts), functional interconnection (seeing how the parts work together with the whole). There is very creative use of the edge space and margins (in this case, the otherwise unused edge of the building). This space is also working on multiple levels: in this case, the social/community as well as the ecological. 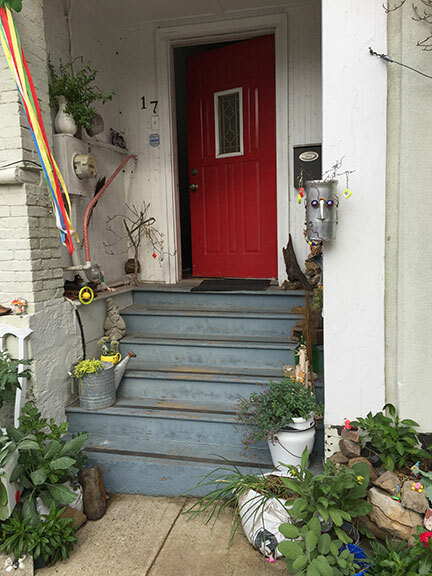 Finally, there are the areas near the stairs and leading up to the actual building that have more vegetables, flowers for pollinators, and more. Trinity is obtaining a yield with her herbs and veggies and also working to redistribute surplus and engage in people care and fair share. Front edge spaces from another angle. 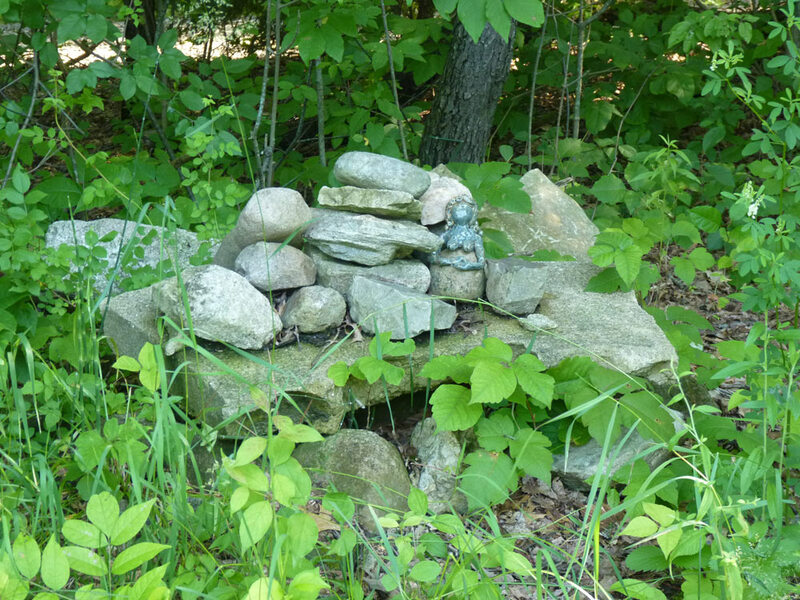 One of the things you can see here is how she used rocks and built a bed to build soil. 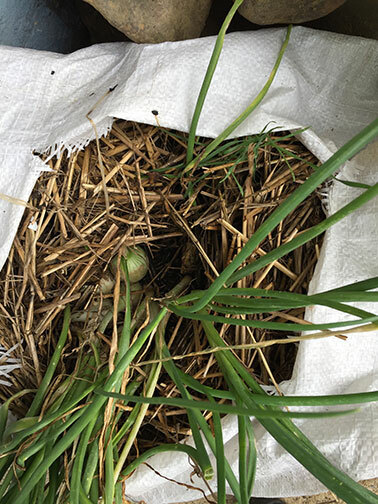 The other thing she did (which I’ll describe in more detail below) is use old feed bags, straw, and small amounts of soil to grow a real vegetables! This is embracing renewables and freely available resources. And finally, after walking past this delightful space, you feel welcomed as you enter the building. What I like about this as a permaculture demonstration site is that it is intensive, functional, and engaging. 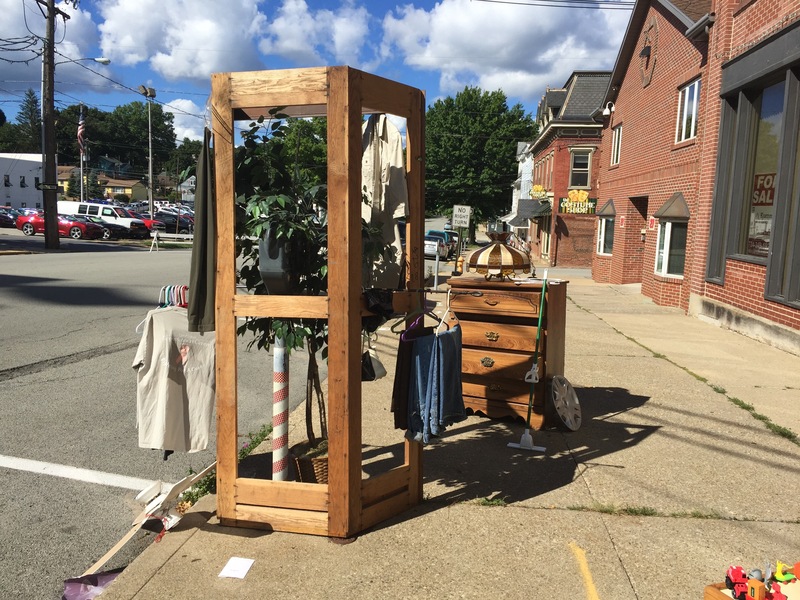 Each day, it brightens the downtown area and community, while clearly demonstrating many of the principles that can help us live more rengeneratively. This is a wonderful example of how people in urban settings can do so much! The other outdoor space that Trinity is intensively working is the only space where she has full solar gain–the rooftop. She has a serious start to a lovely rooftop garden, even getting her vegetables in late (late June) due to her recent move. Recently, when I visited with her, she fed me celery and tomatoes from this very rooftop garden! Trinity has re-used old feed bags as planters. They hold water, are extremely light (to not put undue stress on the building roof), and are otherwise using waste as a resource. Essentially what she did is use the “strawbale garden” technique in feed bags instead–planting her veggies in a small amount of soil in the center of the bed, but growing primarily in straw as the growing media. This technique does require the plants to be watered fairly frequently, but it works well (and Trinity and I have talked about the possibility of drip irrigation for her garden next year). Here is a nice view of the low-soil, lightweight beds. Onions are doing fine! Here is a nice view from the rooftop garden–again, the green is an incredible contrast to the urban concrete and buildings. 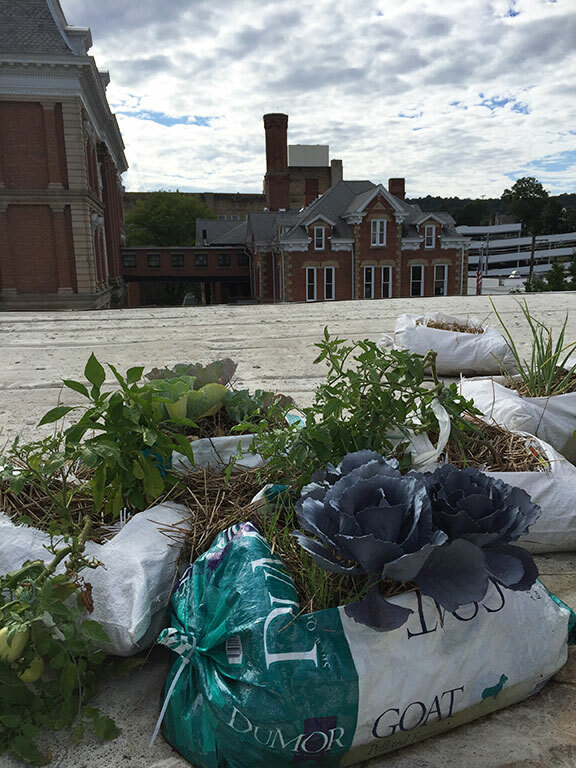 This rooftop garden could be expanded quite a bit to grow tons of food. The light colored roof will also help reflect the heat and keep the veggies cooler in the hottest months. Trinity is consulting with an engineer to see the possibilities long-term for the garden in terms of weight, etc. 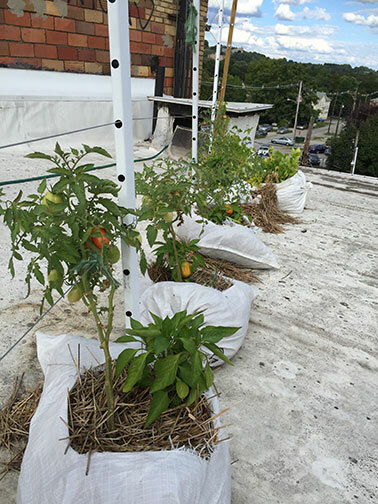 Trinity’s tomatoes are trellised on some old antenna cables and wiring–also repurposed. As you can see, she is certainly getting a great yield out of this garden! And this is only the beginning–I can’t wait to see what she continues to do next year :). 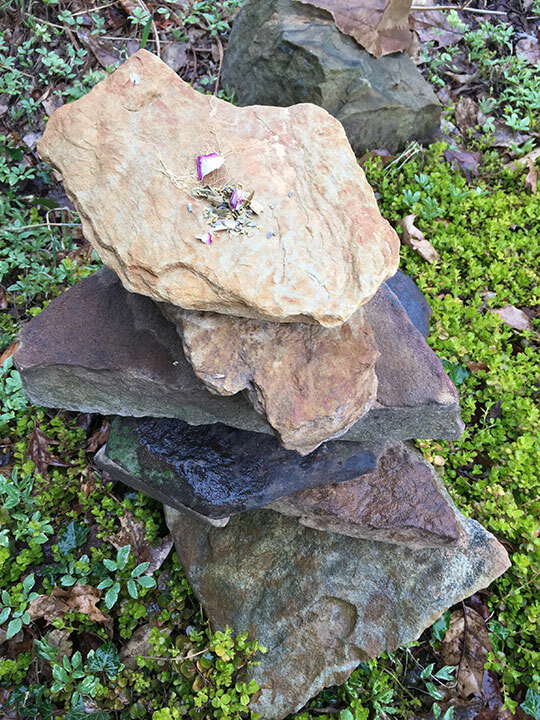 This is just a small slice of some of the outdoor things that Trinity has been doing in her new abode–I’m excited to see where she goes next. Another fun thing that Trinity recently did to engage the community and encourage alternative narratives surrounding sharing and “stuff.” A few weeks ago, our town hosted the Northern Appalachian Folk Festival; it includes music, food, vendors, and a variety of classes (I offered a vermicomposting class, for example). Trinity put out a whole “free” spread in front of her building that encouraged people to take anything they like, leave anything they like, and make a donation. Many people didn’t know what to think of this (it is so far outside of mainstream capitalism today!) but caught on and joined in on the fun! On the broader scale, this kind of action links with the gift economy movement. Gift economies and circles are springing up all over the USA, and certainly, have been in place in many parts of the world. It functions entirely different set of assumptions: it is about care and support, not exchange. I linked above to Charles Eisenstein’s discussion of the Gift Economy, which I think is a good place to understand this philosophy better. Trinity is embracing the idea of “growing where she is planted.” Every space we inhabit has its limitations–in the case of Trinity, she has no soil. Instead, she has turned the problem into a solution by capializing on what she does have: frontage, visability, and a beautiful roof with solar gain. Trinity literally grows where she is planted on many levels. Its a beautiful representation of the three permaculture ethics: earth care (growing things, pollinator plants, bringing greenery back into concrete); people care (offering free food, sitting space, beauty, community), and fair share (giving to others any surplus). I hope you have found her work to be inspirational on your own paths, especially for those of you in limited living circumstances. I will continue to follow her on this blog as the space develops and grows!